Small progress, but great games played ! 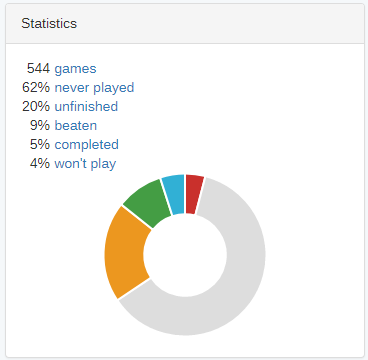 During march, I've played a lot of games: around 20 different games played, including Steam and Uplay games (I played a bit of Far Cry 3 and Watch Dogs 1). I managed to finish some nice games during a backlog fighting event, but not as much as I wanted since a lot of my time went into playing The Division 1. I had this game for a long time but never played a lot. Someone gave me an AMD coupon for the second game, but I'm still waiting for the game code to activate. While waiting, I thought it was the right time to play the first one. And I really love it ! I'm almost level 30 and finished all story missions and it's awesome. Can't wait to play the second game ! Also, I was lucky enough to win some great games this month. I got Kingdom Come, Frostpunk and Ori. I only started KCD and after 14 hours in it, I really love this game. I'm a fan of RPGs but this one is different as it's really realistic and immersive, there's no magic potions, spells and dragons... And it's great this way. The story is really good from what I've seen so far. I also played and finished Metro 2033 Redux on GOG version, and it's an awesome FPS ! And tell me, how was your month ? What fun did you played ? I've beaten this game in coop with my 6 years son. We didn't got the 100% but finished all story stages and got some fun playing in open mode too. It's really well-done and it's a great game for kids, with some tricky parts that require some skills if you want to progress. Beautiful game with nice story and background on Inuit way of life, but the gameplay can be really annoying. I died a lot and had to repeat some parts more than 10 times because controls are somehow not precise enough. I didn't played the DLC but I'm not sure I will as I've read it's harder than base game. Great little gem, really short but beautifully crafted. The atmosphere is awesome, and the story too. I'll come back to get all achievements. I've beaten this game in Redux version on GOG, so the progress is not up-to-date on Steam. Awesome FPS with incredible atmosphere and it can be really scary. The shooting part is well-made, and the story is not bad. One of the best FPS I've played ! February 2019 will mark a turning point in my player life: I bought a virtual reality headset (Lenovo Explorer). I had been interested in it for a long time, and I came across a good opportunity. And I'm not disappointed, it's exceptional! So my month hasn't been very productive in terms of backlog fighting. I tested a lot of free demos and VR games (War Thunder and Google Earth VR for example), and I bought some good VR games: Beat Saber, which alone is worth the investment, Project Cars 2, and IL-2 Sturmowik, which I refunded because it's not really fun to play (but it's really impressive to fly !). My Steam wish list has doubled in volume, with lots of VR titles I want to try. But I'm going to stay reasonable, as I already have a lot of VR compatibles games to play: Subnautica, American/Euro Truck Simulator, Dirt Rally and Elite Dangerous, at least. Unfortunately, the lack of space in my flat games prevent me from playing full room scaled games like Payday 2. In parallel, I started a new run of Fallout New Vegas, which I had only played a few hours and never finished, and Metro 2033 Redux (in GOG version). EDIT: I forgot to mention that I also played around 35h of Apex Legends. Another reason why I didn't finished any game this month ! A great start for the new year ! In good resolution of the year 2019, I decided to stop TESO for a while in order to progress on my backlog. As a result, I played more than 20 games this month and finished 12, including 4 of my ABC Challenge! So the year is off to a great start! I passed some time on flight simulators (FSW and XP11), one of my passions among many others. I am doing a tour of Europe in a small light plane, with one-hour stops, just to visit. I also progressed on Epistory, which I like very much, and which I play with my 6-year-old son next to me: he has to read the words so that I can type them, so he can work on his reading at the same time ! I managed to contain my game purchase, even though I fell for a bundle to get Homeworld Remastered and Immortal Redneck. I was also gifted Just Cause 3, which I started and which I like very much. It replaced Jydge in my ABC Challenge, which I dropped because of the grind needed to unlock the levels. One thing that will grow my backlog is that I bought a WMR headset (Lenovo Explorer) and I start to look at VR games on Steam. So much things to try ! Nice solitaire game with some cool features. I didn't know I could like a game like this, because I'm not a big fan of card games in general. I spent 12 hours to finish the main story and had a good time. I loved this game, and especially the time-based story, very coherent and engaging. The game is beautiful, the series that is interspersed between the acts is also well done (the actors are great!) and the mix of the two pleased me, I would like to see other games use this mechanism. The gameplay of the game is very pleasant with the different powers at our disposal. I had a little trouble beating the end boss, but after 10 attempts I managed it! Hellblade will have been complicated for me to finish. I started it a year ago, but the atmosphere of the game and the gameplay of the beginning didn't make me want to continue. I played it in 30-minute increments in 2018, and then in January, I decided to finish it because I was more than halfway through. And I did the right thing, because the second part of the game is much better: more interesting, more varied, the battles are finally tough and the environments crossed are breathtaking. In the end, it's a real masterpiece for me, a unique game of its kind. By the theme of course, and by the fact that everything in the game is done to make the player feel what Senua feels: the absence of hud, the sound and voices, the absence of tutorials (I only discovered at the end that you could kick in combat…), the slowness of movement. A great game then, which I am very happy to have finished! This game attracted me at first because I'm a big fan of Steven Wilson, who is the author of the game's music. I had no idea what I was getting into and was pleasantly surprised. First of all, by the graphics, magnificent and poetic. By the music of course, even if I already knew the songs, instrumental remixes of SW songs. Finally, by the history, which touched me a lot, to the point of having a little tear shed at the end. However, the gameplay is very average, with passages to review several times without being able to accelerate or pass them. I ended up using a guide to avoid unnecessary loading. An original game where you have to paint paintings in a particular style to please the customers. There are apparently 4 possible ends, but I finished the game with the easiest end to get, because painting with the mouse with Paint tools is not what I like most…..
1st hidden objet game I play, it was OK, but it’s not my cup of tea. Small game where you shoot ennemies to get orbs to save the world. Really ugly but the gameplay is somehow fun with the jetpack. Another game where you read without making any choice. The story of this one is great, as well as the subject (old person who lost memory). I had a good time playing it. Arcade and old-fashion Space invaders game, which require some skills to progress and get all achievements. It was fun ! I made some progress on my backlog although I still played a lot of TESO due to the event of the new year. But overall, with the luck I had at the various Christmas events, I won a lot of games and my backlog grew even bigger. And as if that wasn't enough, I bought Assassin's Creed Odyssey on Uplay following a good deal. 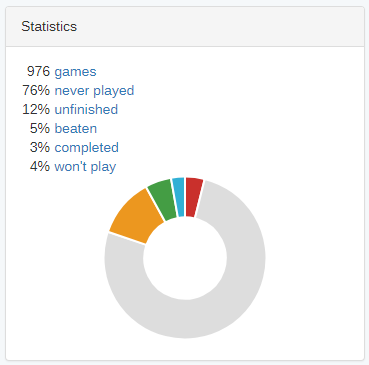 In 2019, I want to finish more games than in 2018, especially my Steamgifts wins and the other games I won elsewhere. I've stopped playing TESO for now, so I'll have a lot more time for my backlog fight ! Not a bad game, but the last levels are almost impossible to complete without a solution. Nevertheless, I had a great time playing this game, it's really unique, with its black and white graphics and mouth-made sounds. A really beautiful and easy to finish game, with relaxing graphics and music, it's cute and well-made, but really short. Great game to play with kids. Any plan to support other stores ? With all the stores that are out now, and new ones coming like Epic store, I wonder if its’ possible to add them to the website in order to manage your whole backlog in one place. 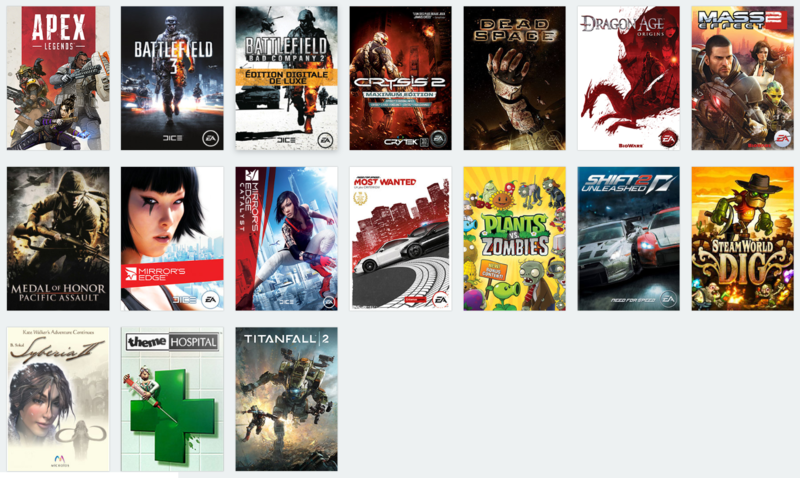 It would be really nice to be able to track Uplay, Origin and GoG games at least. I imagine it’s a lot of work to fully integrate other stores, but perhaps you could add a way to manually add games with their store links, and they would appear on your games list with a particular icon ? Waht do you think about that idea ? I had a lot of fun playing games this month. I spent a lot of time on ESO again (more than 90 hours...) and I still enjoy it a lot. But I managed to take some breaks from this game to play others games and to finish 2 (small) ones. And I discovered really nice games. I started to play Quantum Break and I really love it despites a really bad optimisation on PC. Also tried the very beginning of Murder Soul Suspect and I like the atmosphere of the game. So much good things to play ! I'm not a big fan of point & click, but I really appreciated Silence for its history, atmosphere and graphics. A relaxing game, which I was able to play with my children, it's calm, non-violent, even if the ending is a little emotional. A very good little game that I'm happy to have finished. Lot of time passed playing TESo again this month, while I have my subscription running I try to progress my various characters. I really like this MMO and its community, it's really fun and well done, and I still have an incredible amount of things to do ! I managed to tried some games gifted by friends, and I finished a really short one, Superflight, a really good game. Great little game, all about scoring and achievements as there's no story nor ending. The gameplay is really fun and challenging, the speed feeling is great too and the graphics are colorful ! TESO is eating all my gaming time...again ! I've decided to make a report for 2 months at the same time because I forgot the August post and I didn't made any progress on my backlog since I (almost) only played The Elder Scrolls Online. I have 6 characters on this game right now, 4 at max level and 2 in the leveling process. I like to try different classes and gameplay, and I want to progress with my main on crafting and questing. I started doing the Morrowind expansion quests, and it's great to be back there after having played Morrowind as my first RPG on my first computer ! The only other game I played is Lego The Movie in coop with my son. But we are far from finished ! TESO is eating all my gaming time ! I made some progress on my ABC challenge with 2 games finished (T and Y letters) and some time spent on the "J" letter: after abandonning Jotun, which I really didn't liked, I started to play Jydge, and I'm enjoying it despites the grind needed to progress. A very good puzzle game with new things introduced at each level, which gradually complicates the game without overwhelming the player. Nothing is too difficult, but I had to use some tutorials to get all the achievements. The game runs on a low-end PC and is very nice. There are also lots of winks and references to the video games culture. A really nice assassination ! A little weird and low-cost game. A single level that evolves each time you finish it: gravity is reversed, keys are reversed, you have to find a new secret passage, etc… Not super exciting, thank God it's short! Earlier this month, I managed to finish some games on my ABC plan, and start new ones like Hellblade. But I won a lot of games and got free ones too, so the overall balance for the month is +9..... I hope to finish 2 or 3 games in July because my children will be on vacation (without me.....). Superb and exciting adventure, with a perfect rhythm alternating phases of platforms / climbing and fighting. The characters are endearing and the situations varied, and the finale is top. A real masterpiece that will remain in my memory. I still have the DLC to try. Very good little game even if it is quickly repetitive. Some passages are quite frustrating when you fall several meters because of a missed jump. I reached the end of the game but I didn't go back for the 8 seeds, I'm not interested in doing the whole course again. 25 puzzle levels where you have to bring a bolt on a mechanism. It's always the same principle and the same parts, no renewal on these 25 levels, fortunately it's short! The handling is very bad and made me quite mad. One good point is the graphics. Little shoot'em up that I finished in less than an hour, funny music and very basic gameplay. I finished it for the successes, even if I still have 3 that I can't unlock despite using a guide. Really nice little game, the gameplay is based on 2 buttons and mouse but it’s fast and fun !